This recessed base most of all looks like the kind of bases there were on really large - huge - jars during the early 15th century. This small jars were not made at that time, though, so it can't be right. Both Ming and Qing bases were usually glazed with a normal foot rim. Transitional bases were mostly totally flat and unglazed. One technical observation we can do is to see that the decoration is made up of two different shades of blue. That occurs on real pieces too but are then for example dark contours and light shades. You never see things like this with different shades used for the same things, like grass. That is a modern concept which comes from painting with colors. At the Kraak style hanging cliff the faker had obviously added too much of the greenish cobalt which caused the glaze to retracted totally. This was then masked with two artificial "firing flaws" which looked real enough until I tried them with a knife and they turned out to be plastic. Just a few days ago I came across a strange jar I personally thought looked all right in its details when I saw it. It was just its "whole" that didn't make sense to me. I am pretty clear now about that I think this piece is a clever fake, and I will publish my thoughts here for you to look, think and draw your own conclusions. During this work I have conferred with some friends and been pointed to whole commercial web sites that seems to be made up of pieces of this make, covering the whole of Yuan, through Ming and up to early Qing in different styles but with similar characteristics. The variation covers it all and all kinds of blue and white minyao (peoples wares) are manufactured. I believe that if you find whole groups of this type offered for sale, it will be the excessive use of blackish blue blotches recreating the heaped and piled effect of the early Ming, that will make you suspicious. Cobalt ore was expensive and labourous to grind into color, and was never slobbered on in loads. To study this particular jar I will look into a number of features that make up the whole, as in body, shape, glaze and decoration. 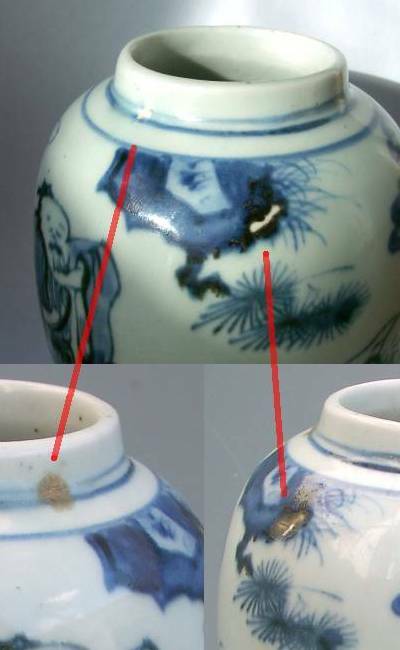 The reason why this jar can't be genuine is because of all these features, however antique or "Ming-ish" they look, they don't belong to the same period and should not occur on one and the same piece. Besides this style problem, there are also a number of technical features that are still not perfected and are clear giveaways when observed closely enough. Going back to the look of this jar, I believe it is the "curly clouds" and the "tall grass" that first catches your eyes, and then we in vain try to make sense of the rest of the features. Then after a while it will dawn on us, that - no - this is not possible. The curly clouds belongs to the period around 1450. It is a distinct characteristic of that period and don't just happen to pop up in decorations of a later date. If that doesn't match with the rest of the jar, then we have a fake. But lets get on with it in the right order. The first thing for us to do is to try to figure out what is this jar trying to be. The shape hints at the transitional / early Qing period or around late Ming to mid 17th century. Small chubby jars like this occurred then, often with an unglazed base. Then, how does the rest of the jar match up with this? The base and the curly clouds in the decoration looks more like early 15th century, but than they did not have these small jars. The fake jars of this make also seems to have "strange" necks. What is most wrong is the decoration. Stylistically it appear ok but somehow or rather it lacks life. The "curly clouds", "tall grass" and the "heaped and piled" effect belongs together with the recessed base to the 1400-1450. If the rest of the decoration does not match this, then the jar is a fake. On the stylistic side, the face is too painterly and belongs to a VERY modern artist's school. Faces on older porcelain are more like "icons". They should represent something and are not supposed to express any particular personality. We can recognize Li Tieguai by his iron crutch and don't need more clues. A garden fence like on this jar - of this "ladder" construction with upright sticks - does not really occur before Wanli - 100 years after the "curly clouds". In any case, they are not common or typical together except on these fakes. Finally I would like to mention a special feature on my original fake jar. If you have studied Kraak porcelain decorations they are very charming in their total disregard of perspective and some such. Trees could perfectly well grow upside down, cliffs can be hanging from the sky, branches can come from nowhere. The whole decoration can look like you are looking at a reflection in a pond, and not directly at the objects. However, this feature with a Kraak style (c 1600) "hanging cliff" is present on my original fake jar, which is fully 200 years off the "curly clouds" etc. as above. One technical observation we can do is to see that the decoration is made up of two different shades of blue. This can occur on genuine pieces too, if they are over-fired, and the cobalt sort of separates itself into two flowing hues, but this is different. On this fake the hues are used on different places. One is of a clear good blue and are used for washes and filling in. The second blue is of a greenish shade and used for strengthening the outlines and creating the "heaped and piled" effect i.e. when the cobalt is bleeding through the glaze. On genuine pieces from early Ming this happened when the cobalt oxide was applied on too thick. Then the cobalt oozed through the glaze and created dark puddles along the strokes. On genuine antique pieces you can often see the large cobalt particles in the color, but not on this jar. Careful with this feature though, it is also being faked. I enclose a picture which clearly shows the two different colors used and how this greenish color is applied generously to created the "heaped and piled" effect. The glaze is basically ok for a minyao. I would like it to be a bit more glossy and even, but seen alone I would say the glaze as well as the body color is a perfect match. If you put this jar next to a late Ming bowl there is no way you can spot a difference in colors before you spot the greenish tinge in some of the blue. Regarding "wear consistent with its age", that is also taken care of. The base is as smooth as a normal Ming jar should be. The glaze also show some wear that is perfectly possibly on a common piece that has been around some and then ended up somewhere until it was "found". If studied in a 10 x loupe the scratches can be said to bee too many in the same directions though. My guess is that the jar has been rotated for some time together with some sand and gravel to get a worn surface. The inside walls of this jar is a frightening mess with too many circular tracks on the inner walls. The genuine antique jars were cast in two parts - one upper and one lower part - and were then fitted together horizontally with wet clay as glue in a way that left a clay ring or at least a fire crack clearly visibly on the inside and often at least discernible on the outside, like a welt. Modern fakes are often cast in just one piece and can then have got their insides messed up with fingers or a stick to hide the fact it was not made in sections. If this is remembered on a fake, the fake is only a few years old. On this picture we can first of all see the Kraak style hanging cliff - which should not bee there - and some of how the "heaped and piled" effect came out. 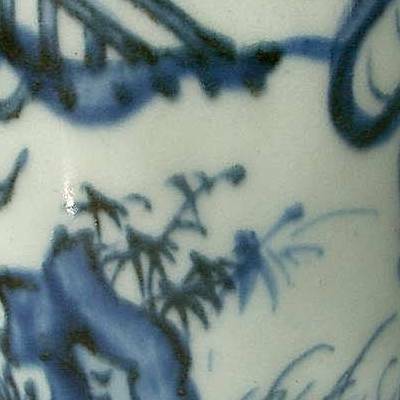 Obviously the faker added too much of the greenish cobalt and the glaze burnt away or retracted totally. This was then masked with two artificial firing flaws that looked quite plausible until I tried them with a knife, and they turned out to be plastic. On a genuine jar from the Ming period, the iron content in the clay is such that any flaw or crack that are exposed to the kiln atmosphere should burn to a reddish tone, like rust. Pretty much as the base is. The burnt red and "slightly recessed base" is also of a type that occurs on large pieces from around the 1450's period. How that tone on the base was achieved I have no explanation for right now. Some added oxide in the kiln or just spray paint seems both as likely. But the firing flaws on the fake jar turned out dead white and needed to be masked, which finally closed the case on this. Regarding if this is a hopeless problem, No - I don't think so after having written all this. The main point is the quality of the originals we want to collect. They all tell a story of the time from which they are. If we look for those values and clues, we can not be fooled by the copies, since they are just not telling the same story. Whatever we call this I believe this is what "genuine" is about. Thank you for being around. I believe this site and network of collectors - through the list and in private chats - are a necessity now and much more so then I could imagine when I started it.